Fresh Lawsuit Against Ailes Slams Fox News' Response To Harassment Claims : The Two-Way Fox News contributor Julie Roginsky says in the complaint that the network's past chairman, Roger Ailes, made unwanted sexual advances while leading her to believe that a big promotion would follow. 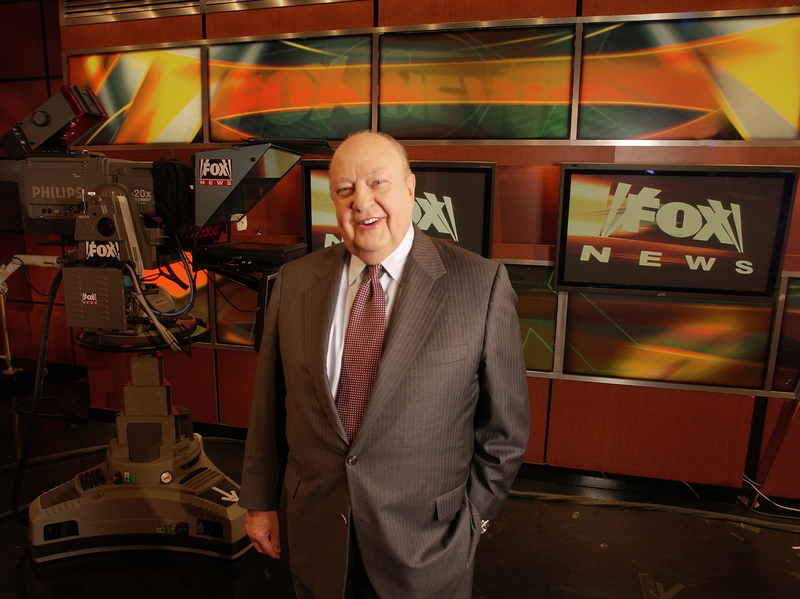 Then-Fox News CEO Roger Ailes poses at the network's New York City studios in 2006. Ailes served as CEO from Fox News' first day in 1996 until his resignation in July. Roginsky spurned the advances, according to the lawsuit, and as a result never received the promotion to become host of the popular early evening program The Five. Roginsky's depiction of life at Fox News even after Ailes' ouster last summer at the height of a sexual harassment scandal suggests a far cry from the changed corporate culture promised by the Murdoch family, which controls 21st Century Fox. Patriarch Rupert Murdoch has led Fox News since Ailes was felled by fallout from the lawsuit by former host Gretchen Carlson that triggered the scandal. Roginsky's suit adds to the list of sexual harassment allegations against Ailes, which also includes those made by former Fox News journalists Megyn Kelly and Laurie Dhue. Through his lawyers, Ailes has denied all the previous allegations to date. Perhaps more troublingly for Fox News and its corporate parent, 21st Century Fox, Roginsky also accuses the network's current president, Bill Shine; its longtime top lawyer, Dianne Brandi; and other senior executives of complicity in Ailes' harassment and of punishing her for raising the issue. In a statement emailed to NPR, Ailes' lawyer Susan Estrich called Roginsky's descriptions of meetings with her client "total hogwash." "The idea that Mr. Ailes would pressure Ms. Roginsky or any other women to have sexual relations with him is total nonsense," the statement reads. "This is about someone who wants to pile-on in a massive character assassination in order to achieve what she did not accomplish on the merits." NPR is seeking comment from Fox News, 21st Century Fox, Shine and Brandi in response to the allegations in Roginsky's suit. Roginsky's allegations arrive as new attention is being given to similar accusations against Fox News' brightest star, Bill O'Reilly. The right-of-center opinion host and Fox News have made payments totaling roughly $13 million over a dozen years to settle complaints that he harassed female former co-workers, according to The New York Times. Suspended Fox News host Andrea Tantaros has also filed suit, citing what she says was sexual harassment by Ailes and O'Reilly. She alleges that Shine also failed to take her complaints seriously. All three men deny her claims. Though some of O'Reilly's offending remarks were captured on tape, he has repeatedly insisted he is a target for wrongful accusations because of his wealth and success. O'Reilly has said he only settles complaints to ensure his children do not have to endure public scorn. The enduring presence of O'Reilly on Fox's prized 8 p.m. ET slot, despite that history, has led some critics to dismiss the commitment of Shine and Brandi to combating sexual harassment and even to question why they retain their posts. Roginsky's suit is likely to fuel those critics further. "Shine retaliated against plaintiff because of her complaints of harassment and retaliation [against Ailes]," the lawsuit reads, "and because of plaintiff's refusal to malign Gretchen Carlson and join 'Team Roger' when Carlson sued Ailes ... Shine also aided and abetted Ailes' acts of retaliation and harassment." Roginsky said in the complaint that Shine and Brandi took no action to investigate her allegations that Ailes had harassed her once they learned of his behavior toward her. The company had put new policies in place and hired an outside law firm to lead an inquiry into the mounting accusations against Ailes, but did not pursue her accusations, according to the lawsuit. Such concerns first arose at Fox well before last summer. In 2011, Shine and Brandi played a role in arranging a $3 million settlement with a former Fox News senior booker and events planner, Laurie Luhn, who alleged Ailes had blackmailed and harassed her into performing sexual acts for more than 20 years. They said they did not believe Luhn's claims at that time. In this case, Roginsky alleges, Ailes' former top deputies sought to forestall criticism and any legal exposure for the network. Roginsky is a 43-year-old single mother who has advised and worked for such leading New Jersey Democrats as Sen. Cory Booker, the late Sen. Frank Lautenberg and the former senator and Gov. Jon Corzine. She joined Fox News formally in fall 2011 after seven years of appearing regularly as an unpaid commentator, the lawsuit states. In her suit, Roginsky alleges that Ailes repeatedly invoked the prospect of elevating her from a contributor's job to be a permanent host on The Five. She contends she merited the promotion given her performance and the ratings when she appeared on the show. Such a perch at Fox would have given Roginsky greater visibility, likely increasing her pay from Fox News significantly into the upper six figures and also propelling an increase in possible outside revenues such as book contracts or speaking fees. Ailes routinely steered such conversations about Roginsky's career to her personal life, her looks and his desire to see her socially, she alleges. "Ailes cynically toyed with Roginsky, saying that he would really like to give her a permanent spot on 'The Five,'" the lawsuit states. "Immediately after this statement, Ailes remarked that 'if it wouldn't get us both into so much trouble' he would take Roginsky 'out for a drink.' "
According to the suit, Ailes continued: "Since being seen in public together would get us into trouble, maybe we could just do it privately in my office instead, so no one would know." Roginsky alleges that when she conveyed she did not think that was a good idea, Ailes shut down any further talk of a promotion. The suit says Ailes refused ever to meet with Roginsky again and pulled her from guest appearances on The Five. Beyond the allegations against Ailes, Roginsky's suit contradicts the representation by Fox News and parent company 21st Century Fox that the network has changed its climate for its female employees since the departure of Ailes under duress last July. Unlike Carlson, Roginsky has no clause in her contract requiring she settle disputes in binding and confidential arbitration. At the Republican National Convention last July, according to the lawsuit, as Ailes' professional fate hung in the balance, Fox News contributor Angela McGlowan told Roginsky that "it's all hands on deck" in defending Ailes. Roginsky alleges she told McGlowan, a former lobbyist for the Murdochs' media empire who served as a conduit to Fox News executives, that she believed Carlson's allegations and could not participate in a campaign against her because Ailes had harassed her, too. When Roginsky and Shine met in late July, the longtime programming chief for Ailes was agitated, telling her that "everything they are saying about Roger is true," as Roginsky's lawyer recounts the meeting in court papers. She was passed over for a hosting job on the midday show Outnumbered. In late November, Roginsky told Shine and his deputy, Suzanne Scott, that she awaited the fulfillment of Ailes' earlier promise to host a show. No such job emerged. Instead, according to the suit, Shine praised a recent documentary, comparing the chemistry of the team that built Fox News to that of the rock group the Eagles.